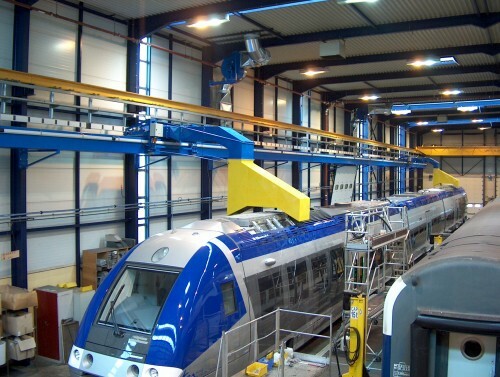 Exhaust extraction fumes systems give a high capacity of extraction in low pressure of any types of locomotives in order to extract diesel emissions produced by engines during park operations and maintenance in rail depots. The system is declined according to railway depot configuration to adapt to needs, standards, ways, and specifics of customer sites. Five different concepts, made in industrial way, is proposed to perfectly fit with the needs and the depot design. The sliding hoods permit to have the perfect adjustment above diesel engine fumes exit. The hood can be folded to use on the same track movable catenaries or roof cranes. The exhaust extraction fumes systems are too much quiet that they usually supply with visual information to show the state of the extraction hoods. With many years of experience, the solution proposed is perfectly adapted to railway depots and more than 10 railway networks use it.